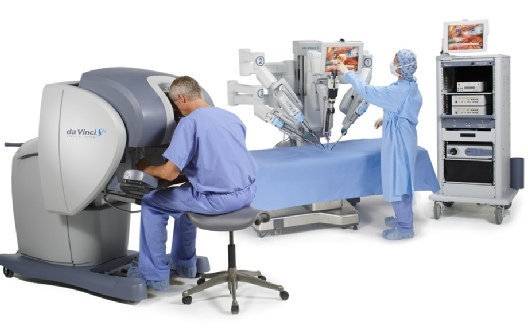 Robotic surgery is the latest advance in minimally invasive surgery, which enables the surgeon to operate using highly manoeuvrable keyhole instruments, allowing ultra-precise manipulation and handling of tissues, while using a high definition 3-D high-definition image, and working in a minimally invasive (keyhole) surgery environment. This equipment is extremely expensive and the capital costs to set up a surgical robot such as the da Vinci™ system costs well in excess of 1.5 million pounds. The disposable costs for each operation may exceed several hundred pounds. 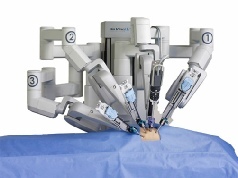 Although the robotic arms can be cleaned and re-sterilised after each procedure, most can only be used up to 10 times before they must be discarded. Unfortunately, given the significant initial cost, the healthcare system in the United Kingdom (both NHS and private sector) has been slow to invest in this technology. 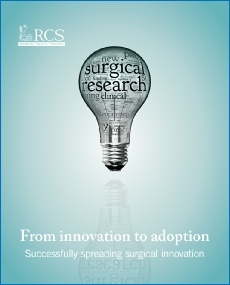 A recent report published by the Royal College of Surgeons , Innovation to Adoption: Successfully Spreading Surgical Innovation has highlighted the fact that patients are missing out on the benefits of these new techniques because the NHS has failed to set up programs to promote their use within the United Kingdom. (https://www.rcseng.ac.uk/publications/docs/from-innovation-to-adoption). This is particularly so in Scotland where robotically assisted surgery is not currently available. However, Aberdeen Royal Infirmary have received funding to set up a robotic surgery unti. The Scottish Government is to invest up to £1 million to complement the fundraising efforts of UCAN, the urological cancer charity in the North of Scotland, to purchase a robot that surgeons use to perform minimally invasive surgery – initially for prostate cancer. It is hoped that this is the start of a process to deliver nationwide robotically assisted surgery. The Scottish Government has also promised to work closely with Health Boards and cancer charities to strategically plan how to best to deliver these services across Scotland. 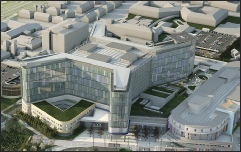 It is expected that patients in Greater Glasgow may be the next to benefit from robotically assisted surgery and an application for funding a robotic surgery unit at new South Glasgow University Hospital has already been made. The da Vinci™ robot has a monopoly on the market at present, in part because of the large number of patents that protect their device and prevent similar devices coming to market. The da Vinci™ robot is 2 m high and 1.5 m across. It has up to 6 arms which pass through tiny (5-1- mm) incisions in the skin (laparoscopic or keyhole). A tiny microscopic 3-D camera gives the surgeon a magnified high-definition 3-D view of the inside of the operation site (which may be in the neck, chest or abdomen). The robotic arms are controlled by the surgeon who looks through a special monitor to obtain a high definition view of the operation site. 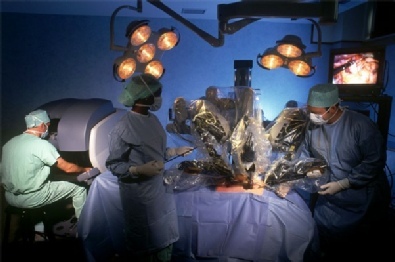 The surgeon operates and manipulates the robotic arms while sitting at a console which is separate from the patient. The console is usually kept within the operating theatre. However the surgical control console does not have to be physically attached to the robot and could be in a room alongside the operating theatre or indeed further afield. The robotic arms are only 10 to 15 mm in diameter but can rotate 360° so they are more dextrous than the human hand. The surgeon also gets a 3-D magnified high-definition view of the operation field, which allows for more precise identification and manipulation of important structures such as nerves etc which can be protected. This is felt to give rise to less blood loss, better results with less chance of nerve injury, a faster recovery and discharge. As a consequence, it is hoped that robotic surgery may lead to improved cancer survival for patients with some selected types of cancer. Kim JY, Kim NK, Lee KY, Hur H, Min BS, Kim JH. A comparative study of voiding and sexual function after total mesorectal excision with autonomic nerve preservation for rectal cancer: laparoscopic versus robotic surgery. Ann Surg Oncol. 2012 Aug;19(8):2485-93. Epub 2012 Mar 21. 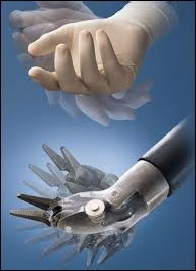 Robotically assisted surgery: where are we at in Scotland?